At the end of 2013, I wrote a post (here) which concluded with me asking if 2014 would be another successful a year for me as a writer. Thankfully, the answer to that turned out to be yes! Overall, I've had less published in the way of quantity, but more in the way of quality and there's a good reason for that. If 2013 was about me finding my feet with flash fiction, short stories and comic scripts, then 2014 was the year I learnt about the 'joy' of editing, Beta readers and re-writes. Firstly then, a few stats. In 2014 I had a total of 6 short stories published, mostly in print form as well as 3 nano fiction tales. Click Published Work for more details. Comics wise, 'Area 101' with Dan Cornwell came out in the fantastic, but poorly marketed METAVERSE anthology. 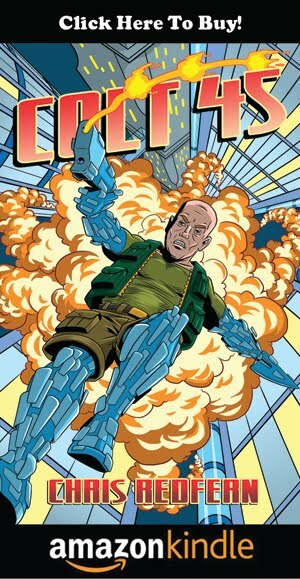 I achieved a personal ambition by getting the cover story for Zarjaz #22 with my story 'Chopper: Different Strokes' aided by Art Droid himself, Jake Lynch. Stories in Hallowscream and Zombies Hi helped me achieve another couple of goals, that of finally getting into Hallowscream and my first Zombie script respectively. So, what exactly was I doing in 2014? Well, firstly I completed a couple of big projects for release next year ('Blast From The Past' in the British Showcase Anthology with Trystan Mitchell and 'Desperate Measures' in GrayHaven Comics with Edward Whatley to name but a few.) But most of my time was spent re-writing my novella. Yes, you read it right... re-writing. COLT-45 was originally a comic script. When that project failed, I decided to resurrect it as a novella. The book itself didn't take me that long to write, as I just expanded the comic script slightly. (Hindsight Corner - Wrong thing to do!) After sending this first effort to a couple of publishers, the advice was generally along the liners of 'reads like a first draft', 'doesn't work' and 'needs to be Beta read.' So, rather brought down to earth, I decided they knew better than me and sent the book away to be Beta read using several different sources. The results of that were just as hard hitting (if not more so) and I realised that my story needed a complete re-write. 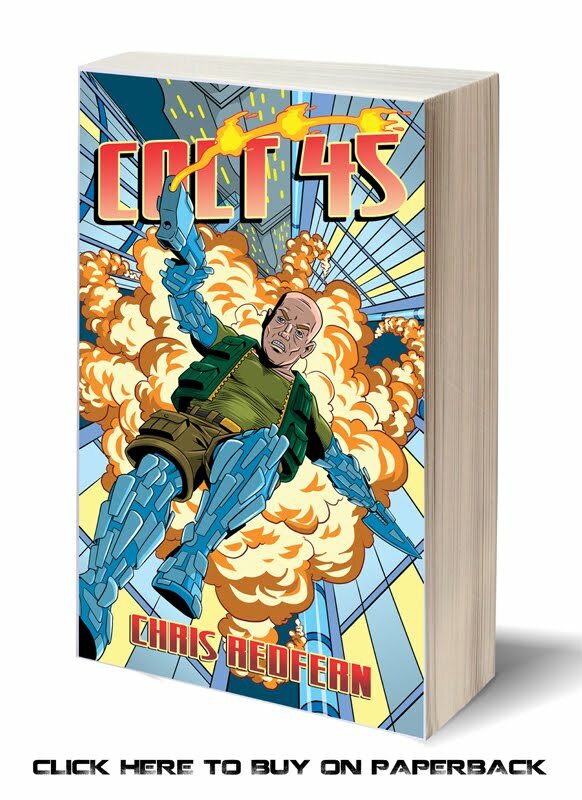 The basic problem was, I'd written COLT-45 in the same way as I'd written the original comic book script. It was short, sharp and far too condensed. What might work as a comic never had a hope of working as fiction prose. In short, I had to change the structure, develop the characters and improve the dialogue.... all of which took about 10 months of solid work! That done and it was ready to be copy-edited. My copy editor will be revealed once the book is complete, but she did a fantastic job of making the story more readable as well as highlighting several more areas that needed further expansion and improvement. So, the end is in sight, albeit with a few more months of work ahead of me. I'm hoping to have the final copy/proof read story in my hand by Easter. After that, well, maybe I'll start looking into self publishing and all that that entails! And so, into 2015 we go, with hopefully more writing adventures to come!